What did an Emergency Manager think of San Andreas? It’s a running theme for me to blog about disaster movies, so here’s my latest installment, after watching San Andreas yesterday evening. CAUTION: contains spoilers! San Andreas (not the most inspired title) see’s Dwayne “The Rock” Johnson as a helicopter rescue pilot go rogue to save his family from the largest earthquake ever recorded. So although it was forumulaic, how did it rate from the presepctive of an emergency manager? First up, many of the situations presented in the film could not happen. The San Andreas fault is a strike-slip fault (or more accurately, a transform fault). This means the earth’s tectonic plates are sliding past each other. If they get stuck, pressure is built up, which is released as an earthquake. However, this wouldn’t be the sort of earthquake to open up massive canyons. It would still be destructive, but not in the same way as presented. Further, the film depicts a tsunami engulfing San Fransisco. 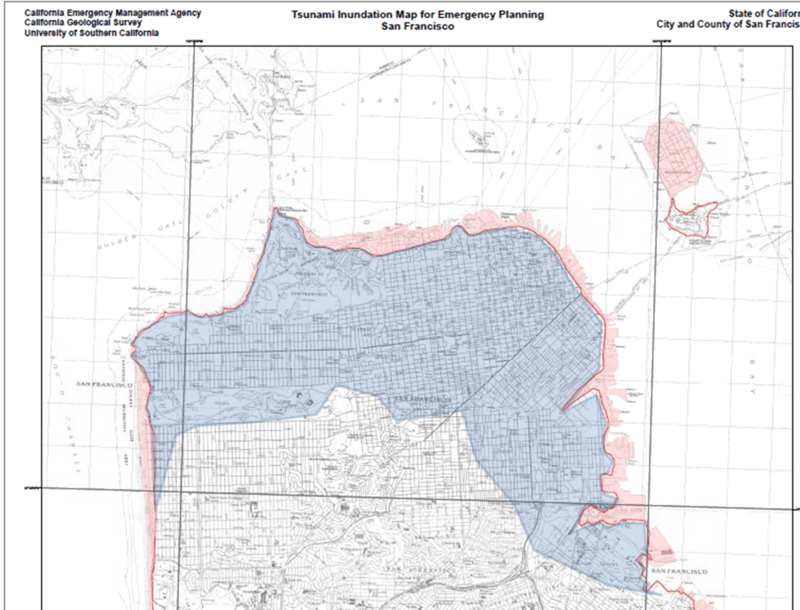 Yes, San Fran has a real tsunami risk and has a warning system in place. However, this wouldn’t be caused by an earthquake with an epicentre on the San Andreas fault as large volumes of water are not vertically displaced when plates slide against each other. The map below shows, in red, the official ‘tsunami risk zone’, and in blue my illustration of the extent affected in the movie (based on what landmarks were underwater and my very limited geographical knowledge of SF!). As you can see, the film uses more than a pinch of dramatic license! This phrase is actually used, and demonstrated, on a number of occasions by the trusty scientist and his sidekick journalist (who is none other than The Good Wife’s Archie Panjabi). Later, The Rock explains what you should do if you can’t find cover. I’ve gotta give them some serious credit for including this, it really is the best thing to do. If Kylie Minogue’s character had followed that advice maybe her blink-and-you’ll-miss-her-falling-out-of-a-building cameo would have been avoided. In the film we see Blake (The Rock’s on screen daughter) construct a rudimentary tourniquet to stop bleeding and see The Rock performing CPR. Knowing some very basic first aid can be life saving. However, one stange thing is that given the scale of the disaster, the movie is notably free of the (presumably) hundreds of thousands of dead bodies. My only explanation for this? That the call to evacuate came just in the nick of time! The usual scenes of highways packed full of cars (and debris) abound, but fortunately our protagonist has access to helicopters, planes and boats to get around such inconvieniences. This brings me to my main issue with the film, The Rock’s self-deployment. As a Search and Rescue specialist he would have been much more useful assisting the official response, than focusing on his own family. that might sound cold-hearted but, to me, the ethics of emergency management hinge on doing ‘the most for the most’. But back to evacuation and shelter, when nature runs out of things to throw at the Bay Area, there are some perfunctory scenes of tented villages, and mentions of support from FEMA and the UN. Fact – these tents were supplied by genuine emergency response organisation ShelterBox! Clearly the producers had been reading up on the UK Joint Emergency Service Interoperability Principles. Whilst the film isn’t about emergency management (for shame!) there were some subtle mentions of emergency services protocols. Most notably, when Blake steals (yes, it’s resourceful, but it is still stealing!) the fire radio to listen to the “multi agency Tactical Command channel that all areas have for emergencies” which sounds a lot like the multi agency talkgroups on Airwave. Whilst the idea of using a landline phone was good, there is an inherent assumption that the physical infrastructure remains intact. Phone lines could have been damaged. I forget what actually happened to her mobile phone, but if possible Blake would have been better sending a text first (less bandwidth so more chance of the message getting through). Bar the occasional scene of people looking disheveled the film has very little focus on anyone that isn’t The Rock, his ex wife or his daughter. Certainly in America, we’ve seen communities come together under their national or local identity (e.g. see post 9/11 response and Boston Strong). However, none of that really featured in this movie. On the other hand though, there is the ‘classic’ scene of looting, which flies in the face of most evidence from real disasters which suggests pro-social behaviour. The display of patriotism at the end (where three military helicopters drape a star spangled banner on (what is left of) the Golden Gate Bridge was a touch over the top! For all it’s flaws, I enjoyed San Andreas. It left a slightly bitter aftertaste that most of California had to be destroyed in order to reunite one family, but I appreciate the need for ‘narrative’. However, maybe a better balance could be struck between widespread disaster and micro-level drama? If you’re a fan of disaster movies head over to Buzzfeed to see if you can match the screengrab to the film! What can annoying kids teach emergency planners?